Savory Kitchen Table: ARE YOU WHAT YOU EAT? When I was a little kid I thought vegetables came from cans and sauces came from packages. You know, just add water and voile you have spaghetti sauce. I thought it was pretty cool that we ate like the astronauts - we also drank gallons of Tang. Back then, "original" Tang was still made without artificial sweeteners. Then I turned 10 and dad cooked for a Thanksgiving dinner with these funny looking green stalks called celery and orange ones called carrots and these big round yellow things called onions and this big pot full of homemade broth and voile I was in love with scratch cooking. Obviously there was a difference between my mom's cooking and my dad's cooking. From then on I became the family cook since mom worked full time and I learned that I preferred scratch cooking with real food to the cans and packages. This was when I also became interested in nutrition and eating well and began reading labels. Years later all this knowledge paid off when I became sick and my doctor asked me to not use certain things - things like preservatives and "fake" or diet foods. ASPARTAME: is an artificial, non-saccharide sweetener used as a sugar substitute in some foods and beverages. The most notable name brand of aspartame is Nutra-sweet. SACCHARIN: is an artificial sweetener. The basic substance, benzoic sulfilimine, has effectively no food energy and is much sweeter than sucrose, but has an unpleasant bitter or metallic aftertaste, especially at high concentrations. It is used to sweeten products such as drinks, candies, biscuits, medicines, and toothpaste. There have been studies trying to link aspartame and saccharin to carcinogens. Some say they are successful, others say they are not - you know all the bureaucratic red tape arguing back and forth for FDA approval type BS. You are never sure who to believe, but as my rheumatologist asked, which receptors in your body are geared for accepting these things? Since the answer is none, then all of these go straight to your liver and kidneys for filtering them out of your body as toxins. I have even read recently that there is a theory that they never leave your body and just keep recirculating. 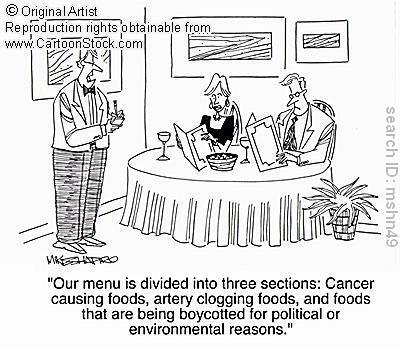 CARCINOGEN: is any substance, radionuclide or radiation, that is an agent directly involved in causing cancer. This may be due to the ability to damage the genome or to the disruption of cellular metabolic processes. Common examples of carcinogens are inhaled asbestos, certain dioxins, and tobacco smoke. Cancer is a disease in which damaged cells do not undergo programmed cell death. Carcinogens may increase the risk of cancer by altering cellular metabolism or damaging DNA directly in cells, which interferes with biological processes, and induces the uncontrolled, malignant division, ultimately leading to the formation of tumors. Usually DNA damage, if too severe to repair, leads to programmed cell death, but if the programmed cell death pathway is damaged, then the cell cannot prevent itself from becoming a cancer cell." While the world is on this ever faster spinning merry-go-round, does that mean that you or I have to be too? NO it does not. I have had this major discussion going on recently with some friends about cooking. They have young children at home and feel that their lives are too busy to cook from scratch. They also say that they don't believe that "fast" foods and "package" cooking is all that bad. Let me leave you with this excerpt from this article: Increased Cancer Risks - Hazards of Genetically Engineered foods so that you can draw your own conclusions. Think about this and do more research on your own if you like, but remember it the next time you say you are too busy to read a label, know your ingredients or cook from scratch. "This Brave New World of Frankenfoods is frightening. There are currently more than four dozen GE foods and crops being grown or sold in the US. These foods and crops are widely dispersed into the food chain and the environment. Over 80 million acres of GE (genetically engineered) crops are presently under cultivation in the US, while up to 750,000 dairy cows are being injected regularly with Monsanto's recombinant Bovine Growth Hormone (rBGH). Most supermarket processed food items now "test positive" for the presence of GE ingredients. In addition, several dozen more GE crops are in the final stages of development and will soon be released into the environment and sold in the marketplace. The "hidden menu" of these unlabeled GE foods and food ingredients in the US now includes soybeans, soy oil, corn, potatoes, squash, canola oil, cottonseed oil, papaya, tomatoes, and dairy products. GE food and fiber products are inherently unpredictable and dangerous-for humans, for animals, the environment, and for the future of sustainable and organic agriculture. As Dr. Michael Antoniou, a British molecular scientist points out, gene-splicing has already resulted in the "unexpected production of toxic substances... in genetically engineered bacteria, yeast, plants, and animals with the problem remaining undetected until a major health hazard has arisen". The hazards of GE foods and crops fall into three categories: human health hazards, environmental hazards, and socio-economic hazards. A brief look at the already-proven and likely hazards of GE products provides a convincing argument for why we need a global moratorium on all GE foods and crops. In 1994, the FDA approved the sale of Monsanto's controversial rBGH. This GE hormone is injected into dairy cows to force them to produce more milk. Scientists have warned that significantly higher levels (400-500% or more) of a potent chemical hormone, Insulin-Like Growth Factor (IGF-1), in the milk and dairy products of rBGH injected cows, could pose serious hazards such as human breast, prostate, and colon cancer. A number of studies have shown that humans with elevated levels of IGF-1 in their bodies are much more likely to get cancer. The US Congressional watchdog agency, the GAO, told the FDA not to approve rBGH. They argued that injecting the cows with rBGH caused higher rates of udder infections requiring increased antibiotic treatment. The increased use of antibiotics poses an unacceptable risk for public health. In 1998, Monsanto/FDA documents that had previously been withheld, were released by government scientists in Canada showing damage to laboratory rats fed dosages of rBGH. Significant infiltration of rBGH into the prostate of the rats as well as thyroid cysts indicated potential cancer hazards from the drug. Subsequently, the government of Canada banned rBGH in early 1999. The European Union (EU) has had a ban in place since 1994. Although rBGH continues to be injected into 10% of all US dairy cows, no other industrialized country has legalized its use. The GATT Codex Alimentarius, a United Nations food standards body, has refused to certify that rBGH is safe. 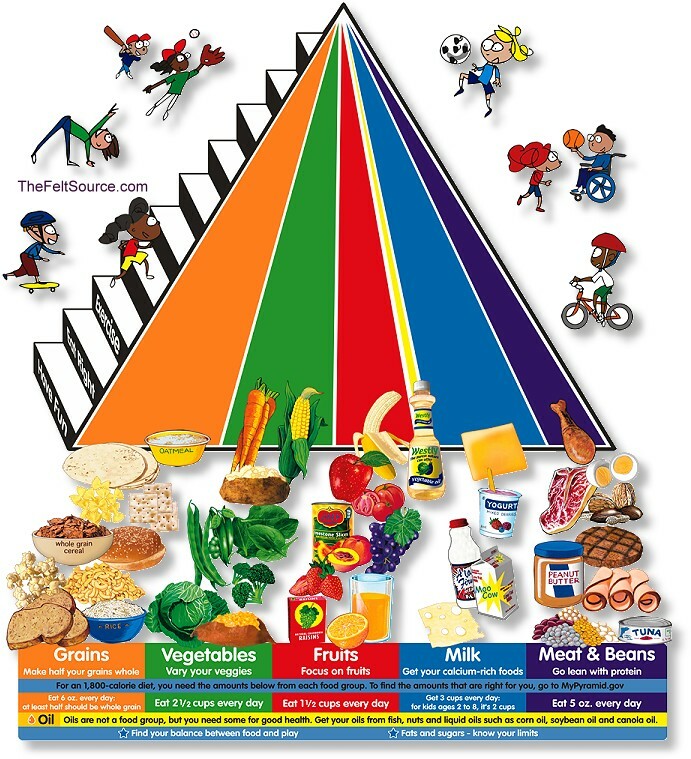 All that said, I love this newer style food pyramid, it really shows you how important each food group really is - see what you think.